This week for Burger Bunday, I made Bobby's recipe for Cheyenne Burgers which were paired up with his Shoestring Onion Rings. The classic combination of sharp cheddar cheese, smoky bacon, spicy barbeque sauce and crunchy onion rings is a favorite of ours and this recipe is probably just as good as any restaurant version I've had. You can't go wrong with this burger and I definitely recommend it! "I admit it, my roots are just about as city slicer as they come. Still, there's a part of me that identifies with cowboy mentality of the West. I once went to a roedo in Cheyenne, Wyoming, and one of the things that I took away from that experience was the idea for this burger; it just seems like perfect rodeo fare. While in my mind's eye the Cheyenne burger is best devoured at that rodeo or maybe while sitting around a campfire, I think its layers of smoked cheddar, spicy barbeque sauce, and crispy fried onions would bringout the cowboy in anyone, anywhere. Feeling extra adventurous? Add a couple slices of crisp bacon to the mix." 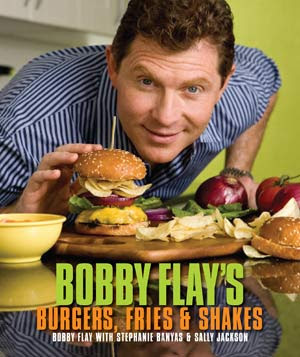 Place the burgers on the bun bottoms and slather each one with barbecue sauce. 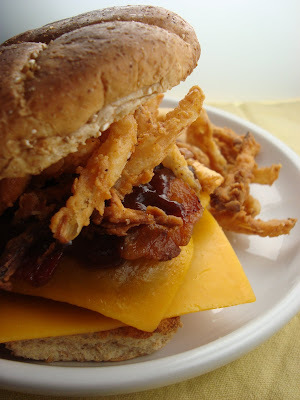 Top with bacon and shoestring onion rings and then the bun tops and serve immediately.